The MONARCH 5 is one of Nikon's most advanced riflescope lines to date. Experience the combined performance of Nikon's legendary ED (Extra-Low Dispersion) Glass, a glass-etched Advanced BDC Reticle, and an incredible 5x zoom ratio. The MONARCH 5 will keep you on target at long distances. Whether you use Spot On Ballistic Match Technology to find the exact aiming points on the Advanced BDC reticle, or instead customize the scope by ordering your own Custom XR Turret (with select Nikoplex models) to dial in the distance, the MONARCH 5 will make your next shot a successful one. The new glass-etched Advanced BDC reticle has unique circles going down the vertical sight post that are used as aiming points to compensate for bullet drop at extended ranges. It also has windage marks on both the left and right side of the post that are calibrated for a 10-mile-per-hour cross wind when the rifle is sighted in at 100 yards. Even if the cross wind is more or less than 10 mph, shooters now have a reliable benchmark to compensate for distance and windage. Whether shooting close range shots or reaching out to the furthest distances, the MONARCH 5’s phenomenal 5-time zoom range and smooth zoom control makes it an effective riflescope for almost any usage. The optical system in the MONARCH 5 riflescope line is second-to-none and features Nikon’s ED Glass lenses that reduce chromatic aberration to provide images that have superior contrast. Each MONARCH 5 riflescope has a 1-inch one-piece main body tube for minimum weight and maximum strength and durability. 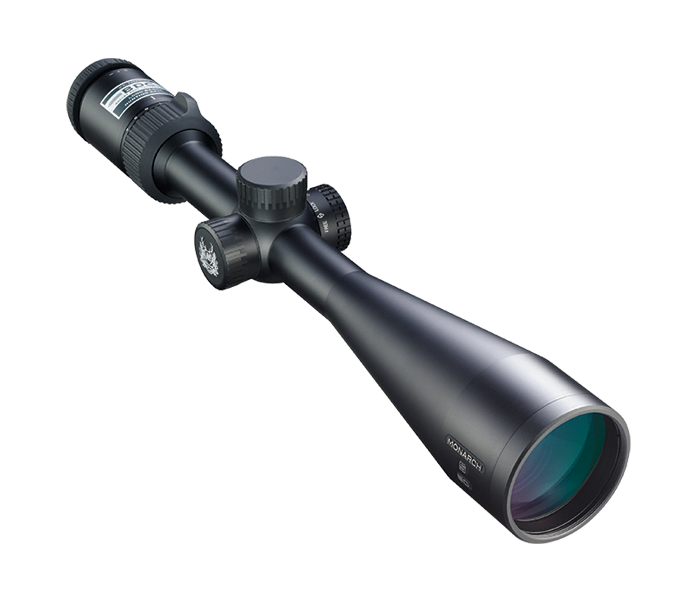 The MONARCH 5, like all of Nikon’s riflescopes, is optimized for use with Nikon Spot On™ Ballistic Match Technology. Spot On allows you to discover all of the exact aiming points on your scope’s reticle at various yardages for your specific ammunition and load. MONARCH 5 scopes feature massive ocular lenses that deliver a huge, exceptionally bright, high-resolution sight picture and constant, non-critical eye relief that can be used on even heavy recoiling rifles. Nitrogen purged and O-ring sealed for complete waterproof, fogproof and shockproof performance.